The early settlers of Euclid Township held their first election April 2, 1810, and Nehmiah Dille was elected constable. On May 7, 1810, Seth Doan was elected sheriff, having received eight votes. At the meeting of the electors in October 1810, Samuel S. Baldwin was elected sheriff. It was the sheriff‘s duty to stop the horse racing on Sundays, because it kept people from going to church. However, Jay Kniffin’s black stallion was established the best horse in the area prior to the sheriff closing down Sunday racing. The city of Euclid was incorporated into a village at an election held on February 14, 1903. The resolution for incorporation was passed on February 17, 1903. The first town marshal, William Covert, was elected April 6, 1903. P. Luberta was appointed as special deputy marshal and Giles Hasmer, regular deputy marshal. Their pay was to be what they earned in fees. The police court report showed that nineteen cases of violations were tried, ten of these were for intoxication. $21.50 in fines and costs were collected. 1907, Ernest Earick is elected marshal. 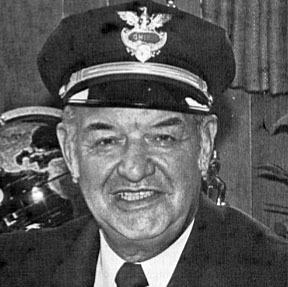 Earick remained Marshal until 1921 & would later become Fire Chief in Euclid Village. He and other early Marshals worked out of the Village Hall which was located on North Street. In 1908, automobiles began to appear on American roadways. These cars could travel 15 to 20 miles per hour, much faster than the average horse could trot. To keep the residents safe from the dangers associated with speeding cars, the Village Council passed a law establishing a maximum speed of eight miles per hour in congested areas and 12 miles per hour in open country. Traffic law enforcement and citations soon followed. Automobiles were getting faster and could outrun the horses used by the Village Marshals. In response to this the Village Council decided to purchase an Indian Motorcycle in 1911. 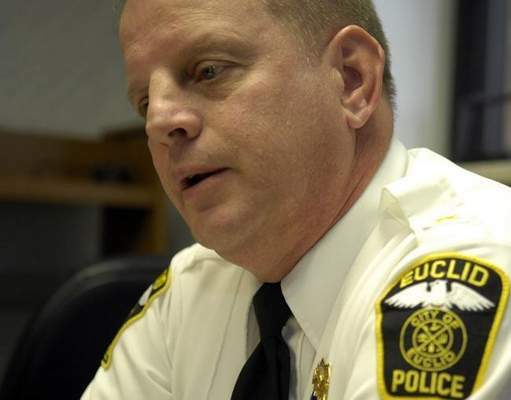 That same year, the Euclid Village marshal’s salary was $960.00. Police officer appointed at $160.00 per month; he had to furnish his own motorcycle. Mayor was authorized to procure a suitable place for an office for the police department equipped with telephones, electric lights, and time clock. Although marshals and deputy marshals remained part of the village police operations until 1927, the first Police Chief, Ralph Fifield was appointed in 1921. This was the same year that Euclid’s police officers were approved to carry weapons, and five revolvers were authorized for purchase by the Village Council. Salaries up to $1,800.00 annually. 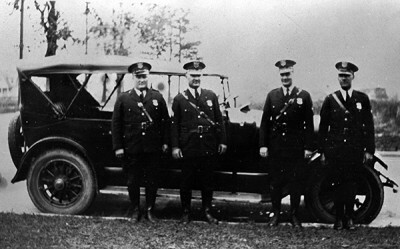 The year of 1924 was a significant for the village police department. This was the year the first police car, a Ford, was purchased at a cost of $558.00. Ordinance 3883 was also passed that year, re-establishing the police department for the Village of Euclid. This ordinance established the office of Chief of Police, and formally structured the department with one chief, two sergeants, and nine patrolmen. Ernest Earick is appointed chief of police. 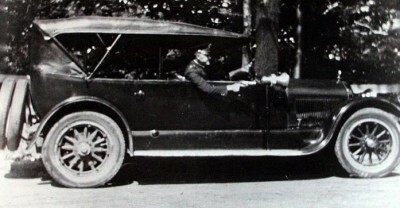 Shown here is a 1925 Touring Car, which was one of Euclid’s first Patrol vehicles. 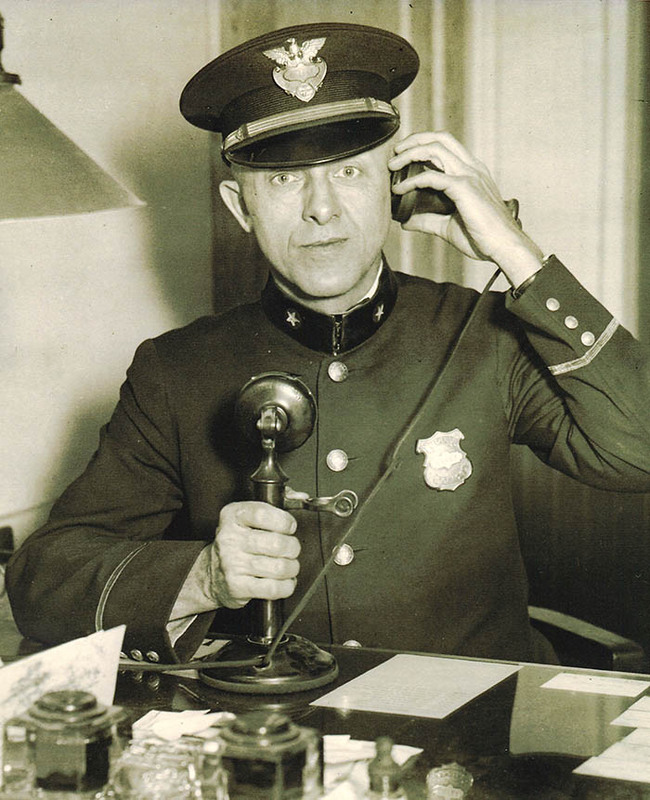 January 1926 – Elmer Hill appointed chief of police. 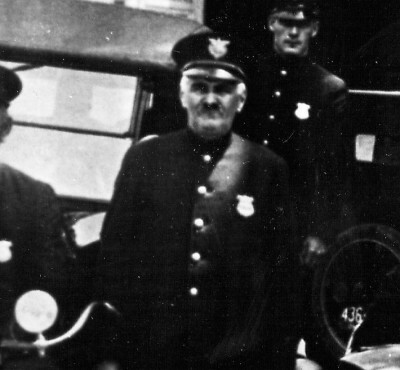 December 1926 – Karl Schmidt appointed chief of police. On April 13, 1929 the Village Hall on North Street burned to the ground. The police department and jail were subsequently moved to a rented building on East 200 Street. Frank Batchelor appointed chief of police. The civil service Commission was established in 1931. Under the Civil Service Commission, police officers were hired based on a written examination and physical abilities. No longer was the Mayor responsible for deciding who would be hired as police officers. 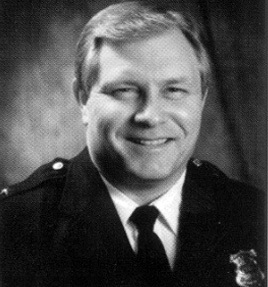 Charles Fox appointed chief of police. In 1938, the police station moved to the basement of the then new City Hall building on East 222 Street. Ronald N. Baehr appointed chief of police. Gerald J. Sullivan appointed chief of police. 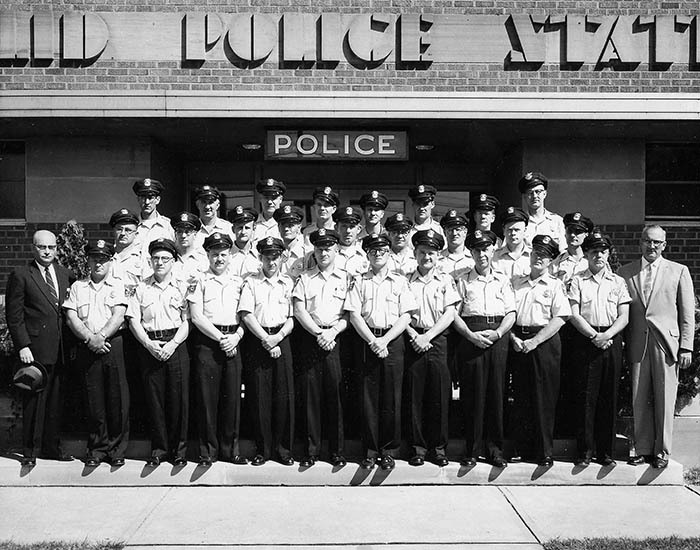 In 1953 the Police Department moved into its present building. Notable event in Euclid Police history: lie detector testing in 1953.
Notable event in Euclid Police history: Radar speed enforcement. Ernest Peters appointed chief of police. Frank W. Payne appointed chief of police. 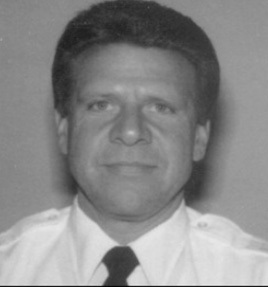 Chief from 1962-1988, Payne restructured the growing police department to meet the community demands. He instituted the use of semi-automatic weapons, replacing the revolver as the sidearm carried by police, and made police training a high priority for Euclid Police Officers. One-officer police patrols implementation in 1968. 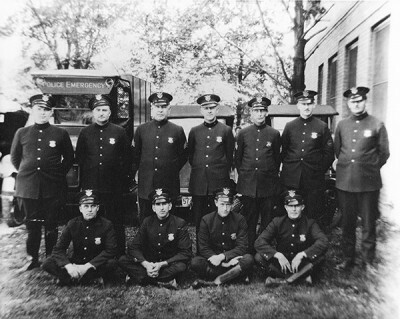 Ambulance service transferred to the Fire Department in 1976. Wayne C. Baumgart appointed chief of police. David A. Maine appointed chief of police. 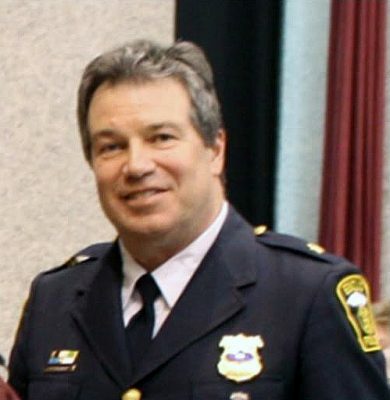 Jim Repicky appointed chief of police. Thomas Brickman appointed chief of police. Scott Meyer appointed chief of police.